From the Times-Dispatch, May 6, 1906. Private Beyond" Had to Be Killed That Day. Richmond, Va., April 24, 1906. Sir,--I send you an account of Gettysburg by the late Col. Joseph Mayo, of the Third Virginia Infantry, Kemper's brigade. This gallant officer was a Virginia Military Institute man, and like every other field officer of Pickett's division, without a single exception, he was stricken in the dreadful assault. It has sometimes been said that all of Pickett's field officers were wounded except Major Joseph C. Cabell, of Danville. This is a mistake. He was also shot in the charge, though not severely. It was stated that Col. Eppa Hunton, of the Eighth Virginia Infantry, Garnett's brigade, rode his hose through the action until both he and his horse were shot. Having his painful wound attended, he turned to ride forward again when his horse fell dead. The account is a graphic one and bears the impress of truth. Col. J.B. Batchelder, in his account of Gettysburg, states that Pickett's men chased the enemy beyond the point where Armistead fell. Col. Mayo's account tells the story of a private who fell twenty paces beyond that point. Co. Mayo some years since passed over the river. His surviving comrades will read with interest the story of their deeds from his pen. The order of march into the enemy's country was left in front; first Ewell's, then Hill's, and, lastly, Longstreet's corps, of which Armistead's, Garnett's and Kemper's brigades of Pickett's Division, brought up the rear. The other two brigades, those of Corse and Jenkins, were absent on detached service. We reached Chambersburg early on the evening of June 27th, and stayed there until hastily summoned to the scene of hostilities on the morning of the 2d of July, having been employed in the meantime, in tearing up the railroad track and demolishing the depot and other buildings. A forced march of twenty-five miles brought us, at about 3 o'clock in the afternoon, to the stone bridge on the Cashtown and Gettysburg Turnpike, within cannon shot of the battle-field. Here General Pickett sent Col. Walter Harrison, of his staff, to tell General Lee of our arrival and readiness for action. THE POST OF HONOR, JULY 3rd. The answer came to find a camp and await further orders. Before dawn the following morning, we moved to our place in the line, our march being carefully concealed from the enemy's view. 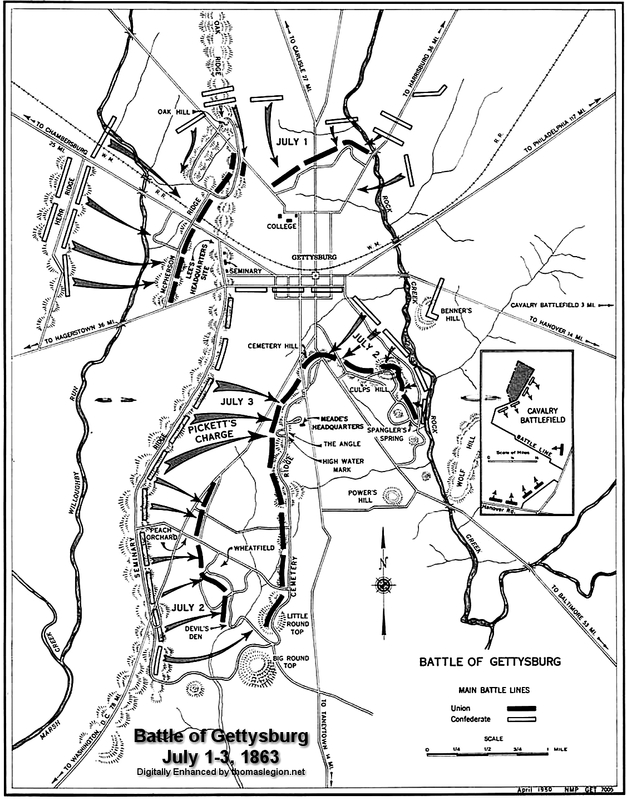 Soon after we got into position, some two hundred yards in the rear of the batteries on Seminary Ridge, General Lee passed in front of us, coming from the right, and a little while afterwards every man in the ranks was made to know exactly what was the work which had been cut out for us. I remember perfectly well General Kemper's earnest injunction to me to be sure that the Third Virginia was told that the commanding general had assigned our division the post of honor that day. He was a Virginian; so were they. Then the arms were stacked and the men allowed to rest at will; but one thing was especially noticeable; from being unusually merry and hilarious they on a sudden had become as still and thoughtful as Quakers at a love feast. Walking up the line to where Colonel Patton was standing in front of the Seventh, I said to him, "This news has brought about an awful seriousness with our fellows, Taz." "Yes," he replied, "and well they may be serious if they really know what is in store for them. I have been up yonder where Dearing is, and looked across at the Yankees." Then he told me a good joke he had on our dashing and debonair chief of artillery. He had ridden out on the skirmish line to get a closer observation of the enemy's position, when a courier galloped up with a message from General Lee. Naturally he supposed Mars Robert wished to ask him what he had seen of those people that was worth reporting; but he was woefully mistaken. This was all the General had to say: "Major Dearing, I do not approve of young officers needlessly exposing themselves; your place is with your batteries." While we were talking an order came to move up nearer the artillery. This was done, and the final preparations made for the advance. Here let me say that General Kemper's memory was at fault when he said in his letter to Judge David E. Johnston, dated February 4, 1886, that he and General Garnett were the only officers of Pickett's Division who went into that battle mounted. He himself gave Col. Lewis B. Williams, of the First, permission to keep his horse, as he was too unwell to walk, and after the General was shot down I saw two of his staff, Captain William O. Fry and Orderly Walker, still on horseback. THE TEMPEST AT 1 O'CLOCK. Meantime the blazing sun had reached and passed the meridian, and the long, painful interval of suspense is swallowed up in the excruciating reality. Where the Third and the greater part of the Seventh lay there was a depression in the ridge, exposing them to the full fury of the tempest of shot and shell which soon came raining down upon them. A faint conception of its indescribable horror may be gathered from a few incidents of which I retain to this day a shuddering recollection. At the sound of the signal guns I went to the centre of the regiment in front of the flag, and sat down upon a pile of blankets resembling a coil of rope; but the intolerable heat of the sun quickly drove me back to the shelter of the apple tree, under which men and officers of both regiments were crowded together thick as herring in a barrel, where I managed to squeeze in between Colonel Patton and Colonel Collcote. The first shot or two flew harmlessly over our heads; but soon they began to get the range, and then came--well, what General Gibbon, on the other side, called "pandemonium." First there was an explosion in the top of our friendly tree, sending a shower of limbs upon us. In a second there was another, followed by a piercing shriek, which caused Patton to spring up and run to see what was the matter. Two killed outright and three frightfully wounded, he said on his return. Immediately after a like cry came from another apple tree close by in the midst of the Third. Company F had suffered terribly; First Lieutenant A.P. Gomer, legs shattered below the knee; of the Arthur brothers, second and third lieutenants, one killed and the other badly hit; Orderly Sergeant Murray mortally wounded, and of the privates, one killed and three wounded. Then, for more than an hour it went on. Nearly every minute the cry of mortal agony was heard above the roar and rumble of the guns. In his modest book, "Four Years a Soldier," one who was left for dead under that apple tree describes it in these feeling words: "Turn you where you would, there was to be seen at almost every moment of time guns, swords, haversacks, human flesh and bones flying and dangling in the air or bouncing above the earth, which now trembled beneath us as shaken by an earthquake. Over us, in front of us, behind us, in our midst and through our ranks, poured solid shot and bursting shell dealing out death on every hand; yet the men stood bravely at their post in an open field with a blistering July sun beating upon their unprotected heads." Doubtless there would have been some consolation to know, as we afterwards learned, that our blue-coated friends over the way were in the same, if not a worse predicament. General Gibbon who with Hancock's Corps held the position we were about to storm says of the execution done by our batteries that it exceeded anything he had dreamed of in artillery warfare; and I believe it is now an admitted historical fact that from the time that the "nimble gunner with limestock the devilish cannon touched," that awful din at Gettysburg was the most fearful sound that ever pealed from the "red throat of roaring war." Colonel Patton called my attention to the gallant bearing of Major Dearing, as he galloped, flag in hand, from gun to gun of his battalion and suggested that it would be safer for us to close up on the artillery; but I told him he must not think of moving without orders and, besides, it was evident that the enemy's fire was rapidly abating, and that the storm would soon be over. The words were barely spoken before it came again; our turn now. I thought at first that it was my adjutant, John Stewart, as a handful of earth mixed with blood and brains struck my shoulder; but they were two poor fellows belonging to Company D (one of them, I remember, had a flaming red head), and another, as we believed, mortally hurt, Sergeant-Major Davy Johnston, of the Seventh, author of the book I have quoted. Strange to say, he was at the time lying between Colonel Patton, and myself. That was among the last shots fired, and as the terrific duel was drawing to a close, General Pickett came riding briskly down the rear of the line, calling to the men to get up and prepare to advance, and "Remember Old Virginia." Our dear old Third, it was a heart-rending sight which greeted me as I moved along your decimated ranks!--while quickly, and without a word of command, the men fell into their places; especially to see our color-bearer, Murden, as fine a type of true soldier-ship as ever stepped beneath the folds of the spotless stars and bars, now lying there stark and stiff, a hideous hole sheer through his stalwart body, and his right hand closed in a death grip around the staff of that beautiful new flag which to-day for the first and last time had braved the battle and the breeze. The devoted little column moved to the assault, with Garnett, and Kemper in front, and Armistead behind in close supporting distance. Soon after clearing our batteries it was found necessary to change direction to the left. While conducting the movement, which was made in perfect order under a galling flank fire from the Round Top, General Pickett, for the second time, cautioned me to be sure and keep the proper interval with General Garnett; Armistead was expected to catch up and extend the line to the left. Then we swept onward again, straight for the Golgotha of Seminary Ridge, half a mile distant, across the open plain. As we neared the Emmettsburg road, along which, behind piles of rails, the enemy's strong line of skirmishers was posted, General Kemper called to me to give attention to matters on the left, while he went to see what troops those were coming up behind us. Glancing after him, I caught a glimpse of a small body of men, compact and solid as a wedge, moving swiftly to the left oblique, as if aiming to uncover Garnett's Brigade. They were Armistead's people, and as Kemper cantered down their front on his mettlesome sorrel they greeted him with a rousing cheer, which I know made his gallant heart leap for joy. At the same moment I saw a disorderly crowd of men breaking for the rear, and Pickett, with Stuart Symington, Ned Baird, and others, vainly trying to stop the rout. And now the guns of Cushing and Abbott double-stocked by General Gibbon's express order, reinforced the terrific fire of the infantry behind the stone fence, literally riddling the orchard on the left of the now famous Cordori house, through which my regiment and some of the others passed. "DON'T CROWD, BOYS"--"PRETTY HOT"--"PERFECTLY RIDICULOUS"
While clearing this obstruction, and as we were getting into shape again, several things were impressed on my memory. First, the amusement it seemed to afford Orderly Waddy Forward, who might, if he pleased, have stayed behind with the horses, to see me duck my head as a ball whizzed in an ace of my nose; next, to see Captain Lewis, of Company C, looking as lazy and lackadaisical, and, if possible, more tired and bored than usual, carrying his sword point foremost over his shoulder, and addressing his company in that invariable plaintive tone, half command, half entreaty, "Don't crowd, boys; don't crowd." "Pretty hot, Captain," I said in passing. "It's redicklous, Colonel; perfectly redicklous"-- which, in his vocabulary, meant as bad as bad could be; then Captain Tom Hodges directed my attention to a splendid looking Federal officer, magnificently mounted, straining his horse at full speed along the crest of a hill a hundred yards in our front, and both of us calling to the skirmishers, "Don't shoot him! don't shoot him!" and, lastly, the impetuous Kemper, as rising in his stirrups and pointing to the left with his sword, he shouted, "There are the guns, boys, go for them." It was an injudicious order; but they obeyed with a will, and mingled with Garnett's people pushed rapidly up the heights. Within a few steps of the stone fence, while in the act of shaking hands with General Garnett and congratulating him on being able to be with his men (he had been seriously ill a few days before), I heard some one calling me, and turning my head, saw that it was Captain Fry. He was mounted, and blood streaming from his horse's neck. Colonel Terry had sent him to stop the rush to left. The enemy in force (Stannard's Vermonters) had penetrated to our rear. He told me that Kemper had been struck down, it was feared mortally. With the help of Colonel Carrington, of the Eighteenth, and Major Bentley, of the Twenty-fourth, I hastily gathered a small band together and faced them to meet the new danger. After that everything was a wild kaleidoscopic whirl. A man near me seemed to be keeping a tally of the dead for my especial benefit. First it was Patton, then Collcote, then Phillips, and I know not how many more. Colonel Williams was knocked out of the saddle by a ball in the shoulder near the brick-house, and in falling was killed by his sword. His little bay mare kept on with the men in the charge. I can see her now as she came limping and sadly crippled down the hill. I saw her again at Williamsport in care of his faithful man Harry, who asked me what I thought old master would say when she was all belonging to Mars Lewis he had to take home. Seeing the men as they fired, throw down their guns and pick up others from the ground, I followed suit, shooting into a flock of blue coats that were pouring down from the right, I noticed how close their flags were together. Probably they were the same people whom Hood and McLaws had handled so roughly the day before. "Used up," as General Meade said of them. Suddenly there was a hissing sound, like the hooded cobra's whisper of death, a deafening explosion, a sharp pang of pain somewhere, a momentary blank, and when I got on my feet again there were splinters of bone and lumps of flesh sticking to my clothes. Then I remembered seeing lank Tell Taliaferro, adjutant of the Twenty-fourth, jumping like a kangaroo and rubbing his crazy bone and blessing the Yankees in a way that did credit to old Jube Early's one-time law partner, and handsome Ocey White, the boy lieutenant of Company A, taking off his hat to show me where a ball had raised a whelk on his scalp and carried away one of his pretty flaxen curls, and lastly, "Old Buck" Terry, with a peculiarly sad smile on his face, standing with poor George and Val Harris and others, between the colors of the Eleventh and Twenty-fourth, near where now is the pretty monument of colonel Ward, of Massachusetts. I could not hear what he said, but he was pointing rearwards with his sword, and I knew what that meant. As I gave one hurried glance over the field we had traversed, the thought in my mind was repeated at my side, "Oh! Colonel, why don't they support us?" It was Walker, General Kemper's orderly, unhorsed, but still unscathed and undaunted, awkward, ungainly, hard-featured, good-natured, simple-minded, stout-hearted Walker, one of the Eleventh boys, I believe; only a private doing his duty with might and main and recking no more of glory than the ox that has won the prize at a cattle show. At the storming of the Redan when Wyndham's forlorn hope tumbled into the ditch and couldn't get out, owing to the scarcity of ladders, and the few they had were too short, the men huddled together dazed and bewildered, and were mowed down like dumb beasts by the Muscovite rifles, because there were no officers left to lead them. There was a notable exception, an Irishman, scrambling up the scrap, he shouted, "Come up, boys, follow the captain." The captain fell, but Pat went on to immortality. It was not so that day at Gettysburg. UNKNOWN PRIVATE WHO FELL BEYOND. Twenty paces beyond the spot which is marked to tell where stout old Armistead fell, the foremost hero of them all, a humble private, without a name, bit the dust. The man in blue who told the story had a seam in his cheek. "I tried to save him, but he would not give up, so I had to kill him to save my own life." "What orders do you leave us, my lord, if you are killed?" asked Hill of Wellington when the pounding was hardest on the famous plateau at Waterloo. "Do as I am doing," he replied, and turning to the men, he said, "Boys, you can't think of giving way. Remember old England." And well it was for old England that behind the Iron Duke was a wall of iron men. Calling to the group around me to spread themselves, I led the way back to the woods in rear of our guns on Seminary Ridge. Realizing painfully our own sad plight, we were, of course, anxiously concerned for the rest of our people. But soon Mars Robert came along, followed by his faithful aides, the two Charleses --Venable and Marshall. How ineffably grand he appeared--a very anointed king of command, posing for the chisel of a Phidias, and looking on him we knew that the army was safe. So ended our part in the day's bloody work. Recommended Reading: Pickett's Charge--The Last Attack at Gettysburg (Hardcover). 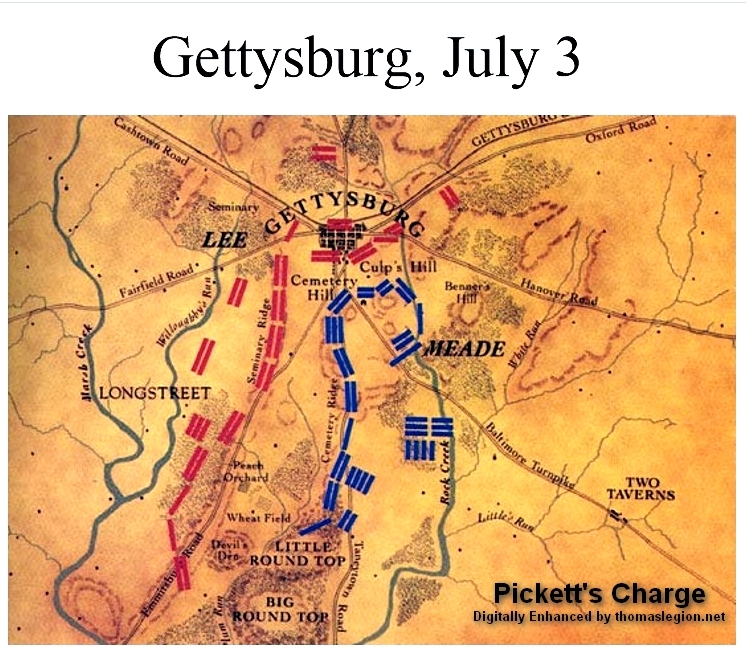 Description: Pickett's Charge is probably the best-known military engagement of the Civil War, widely regarded as the defining moment of the battle of Gettysburg and celebrated as the high-water mark of the Confederacy. But as Earl Hess notes, the epic stature of Pickett's Charge has grown at the expense of reality, and the facts of the attack have been obscured or distorted by the legend that surrounds them. With this book, Hess sweeps away the accumulated myths about Pickett's Charge to provide the definitive history of the engagement. Recommended Reading: Pickett's Charge in History and Memory. 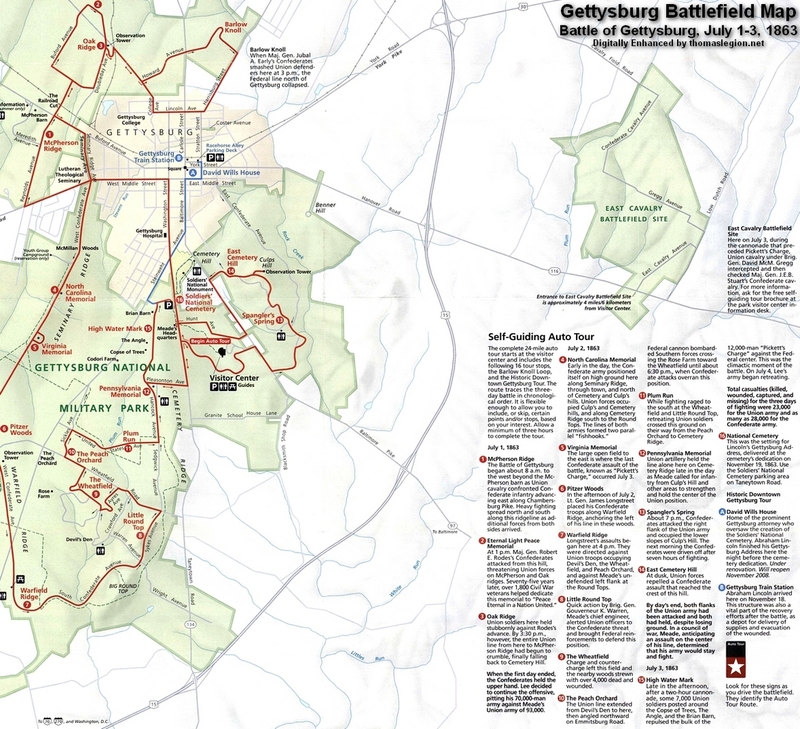 Description: Pickett's Charge--the Confederates' desperate (and failed) attempt to break the Union lines on the third and final day of the Battle of Gettysburg--is best remembered as the turning point of the U.S. Civil War. But Penn State historian Carol Reardon reveals how hard it is to remember the past accurately, especially when an event such as this one so quickly slipped into myth. She writes, "From the time the battle smoke cleared, Pickett's Charge took on this chameleon-like aspect and, through a variety of carefully constructed nuances, adjusted superbly to satisfy the changing needs of Northerners, Southerners, and, finally, the entire nation." Continued below.